Winemaker’s Notes: Intense and bright rose’ color. Aromas of red berries (raspberries, red currant). Fresh and lively attack, wine displaying a lot of freshness, roundness with aromas of red fruit (strawberry, raspberry). A lot of minerality on the finish. My Review: I don’t know about where you live, but we’re full-swing into rose’ season here in North Carolina. While my wife and I enjoy rose’ throughout the year, it’s hard to pass up in the hot, humid Raleigh summers. Fortunately, my house is full of varying shades of pink just begging to help take the edge off. 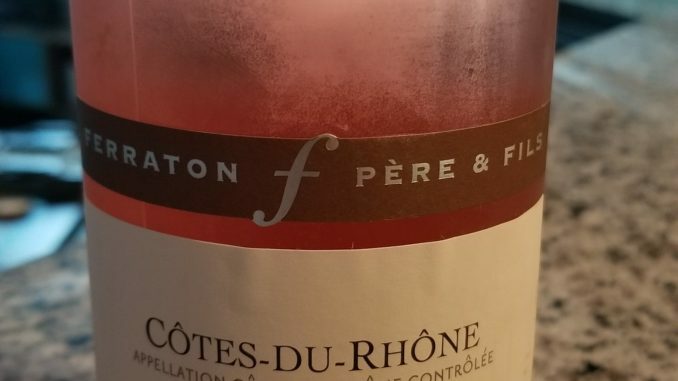 Like the 2017 Ferraton Pere & Fils Cotes du Rhone Samorens Rose’. In the glass the wine was an almost bubble gum shade of pink. On the nose I picked up raspberry notes, while in the mouth the wine was crisp and refreshing, with flavors of strawberry and a hint of white pepper on the finish coming through. My wife and I paired the wine with a pork tenderloin off the grill, and the crisp berry notes were a great balance to the herb notes from the meat. For $15 this is a great value. I’ve had other wines from this winemaker in the past, and they by and large were enjoyable (I think the Blanc was the only one I wasn’t ready to go out and buy). If you’re like me and you’re always looking for budget rose’ this time of year, you can do a lot worse than this.